Designing a kids room is always an adventure. Creating spaces for kids to play, learn and sleep (hopefully!) that suits their personalities and style – but doesn’t look like they have designed the room themselves. We decided early on we wanted to create a shared bedroom and a playroom, rather than one girl’s bedroom and one boy’s bedroom. There were a few practical reasons for this. I didn’t want one of the children to have a room right off the front door, one room was a single while the other was a double - and it meant we only needed to install one wardrobe. 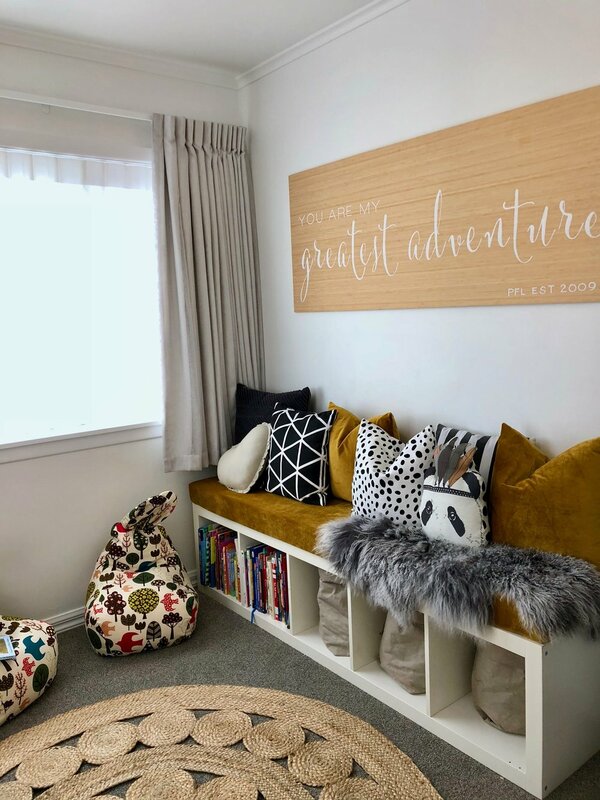 As we renovated and designed there were a few things I focused on; adding storage solutions, creating defined areas in the rooms and adding details the kids would love. The first design decision was the feature wall - colour for me is always a priority in a room. I chose ‘Pale Mustard’ from the Escapade Look range in the Dulux Colour Trends 2018. Colour evokes emotion and when you do yellow well, it represents freshness, happiness, positivity, clarity, energy, optimism, intellect, honour, loyalty and joy – who doesn’t want that for their children? Putting the colour on the wall at the head of beds helps avoid overstimulation. Rather than art work or decals, I decided to display soft animal heads in a cluster on the pale mustard wall. 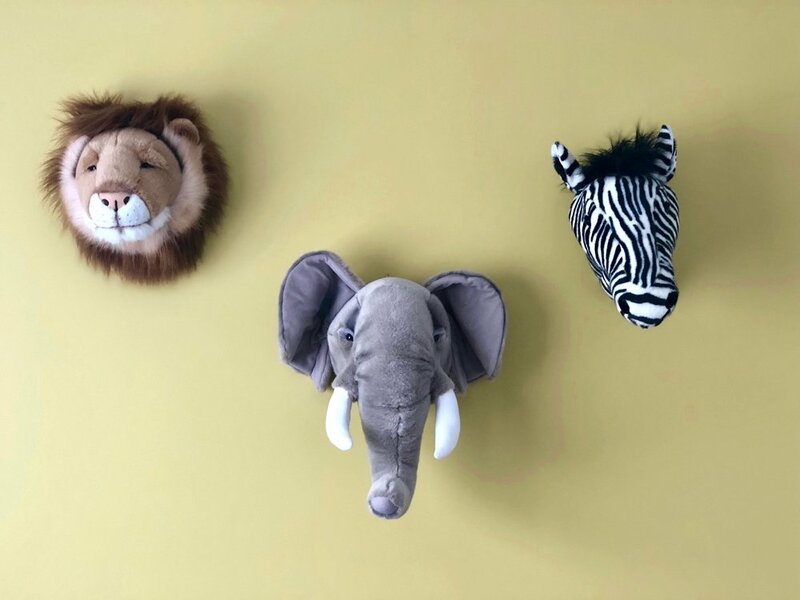 From Little Whimsy’s Wild & Soft Animal Heads range I selected Cesar the Lion, George the Elephant and Daniel the Zebra. 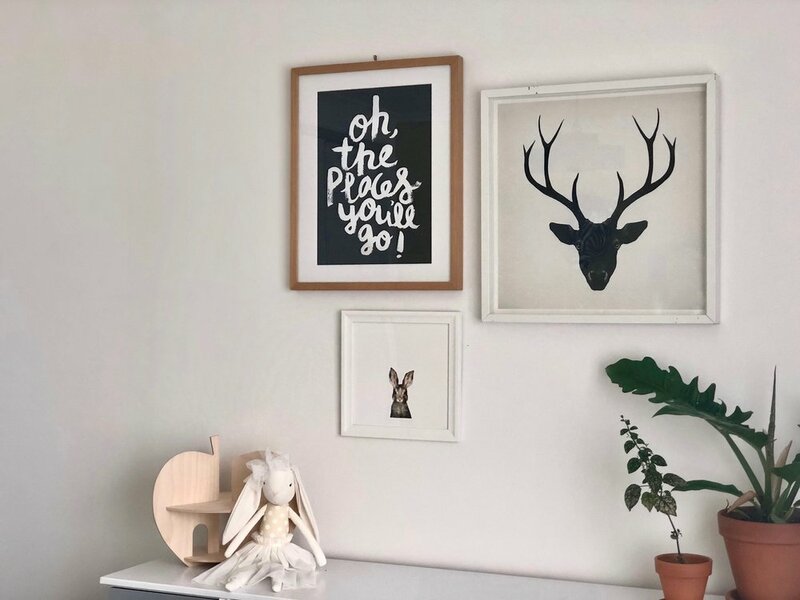 The kids adore their animal tribe watching over them as they sleep and it adds personality to the room. Choosing the right bed, in my mind, is the most important element of designing a kids room. Having kids who sleep well and stay in their beds is a priority for our parenting. Because it’s a shared room I wanted the beds to be identical, but provide Mika with a design that helped her transition from a cot. While a single bed is the most common option, I love toddler beds. Some toddler beds are just a bed designed around a cot mattress. I prefer the IKEA sizing of 160cm x 70cm which is considered a junior bed. A junior bed size is a great size for kids from 2-6 years old and frees up more space in the room. But how do you design a custom size bed? It’s made easy with CutShop. I created a sketch of the beds I wanted, included measurements and some examples off Pinterest of the look I was after - and sent it through to CutShop in Mount Wellington. Within a day I received a quote of $327 for each bed. Through email the programming team at CutShop got a full understanding of what I was after, the material I wanted and what system to use to fasten it together. They sent a detailed plan of the bed design with all the measurements for me to approve, then within four days the beds were created and cut. I selected MDF so I could paint the bed, but I could have selected ply or pine wood instead. I spray-painted the panels of the bed “Dusk Grey” by White Knight and then Caleb put together the beds in the kids room. I finished off the bed by adding an Irregular Dots decal to the headboard. I took a IKEA queen foam mattress and cut out two 160 x 70 mattresses. I wrapped the custom-made mattresses with a single bed waterproof mattress protector. A king single duvet folded in half is the perfect size for the bedding and I bought LEN fitted sheets from an IKEA supplier. For kids, storage is a must – how can small beings have so much stuff?! In their shared room I worked with our wardrobe supplier to create the perfect wardrobe system with plenty of shelves. I updated Mika’s drawers, painting them dusk grey to match the custom-made beds. In the playroom we repurposed Alek’s open shelving to hold toys and books, as well as creating a space for us to sit and watch the kids play. I used spare mustard velvet material from our dining room to create a simple swab and added some fun cushions and a lamb pelt. Because my kids love drawing, I found an activity table on Trademe and bought it for $1. I sanded and painted it satin white and medium grey. The table has two storage components, on the top of the table and a pull-out draw underneath. It stores all of the kids drawing equipment, as well as all our puzzles and transport toys. The thing I love most about these two rooms is that it creates spaces that my kids love and it suits our lifestyle. I can sit at the dining table working or having a cup of tea and watch the kids play (or working through toy negotiations) in their playroom. Mika has transitioned into her “little girl pink bed” without any late night falls from her bed. While it may have been a long two weeks to get them to do it – the kids can now happily fall asleep in their shared room and get out of bed in the morning without waking their room-mate. 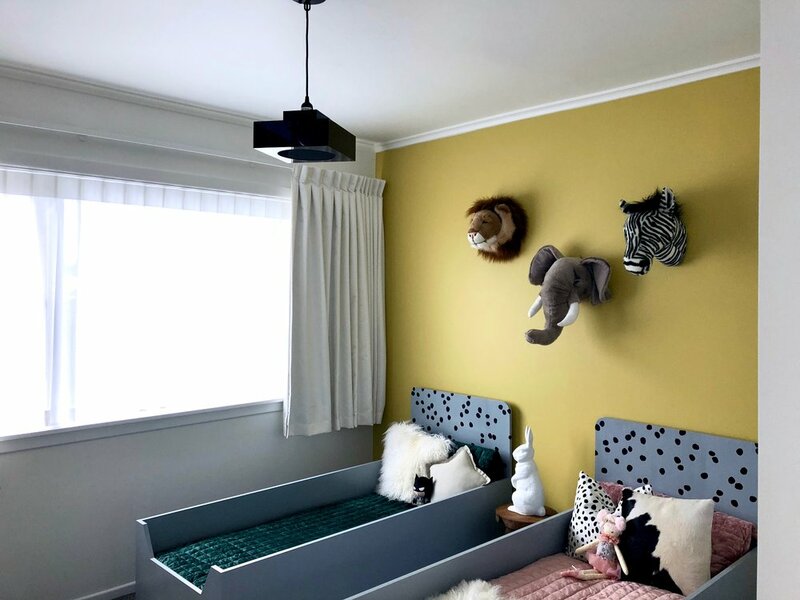 Colour Scheme | Wall and Ceiling Mt Aspiring by Dulux New Zealand | Trims and Windows Okarito by Dulux New Zealand | Feature wall in Dulux ‘Pale Mustard’. Beds Custom Made Toddler Bed Programmed and Cut by Cutshop, painted in Grey Dusk paint colour by Alice. Irregular Spot Decals from Your Decal Shop. Velvet Bedding in Emerald and Rosewood, Throws and Cushions from Adairs. Hide from Aladdin Rugs | Animal heads from Little Whimsy | Rabbit light from Cheeky Raskal | Stool from Briscoes painted Dusk Grey by Alice. 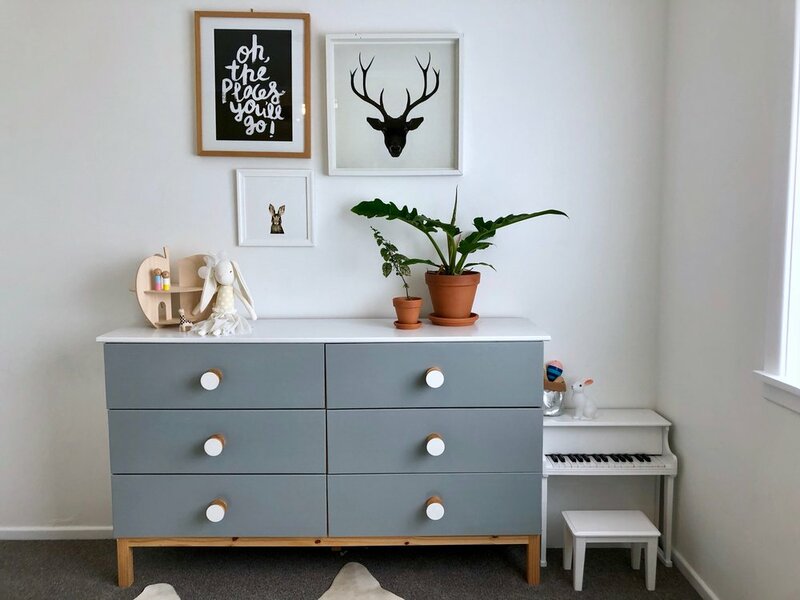 Art from Cheeky Rascal | Piano from Hip Kids | Lightshade from Mr Ralph. Colourful beanbags from Trademe | Easel from Mocka | Lady Bug and Pram from Trademe | Suitcases from Trademe. Shelving Unit from IKEA | Squab made by Alice | Custom Made Wall Plaque from Woven Bamboo | Cushions from Kids Caravan. 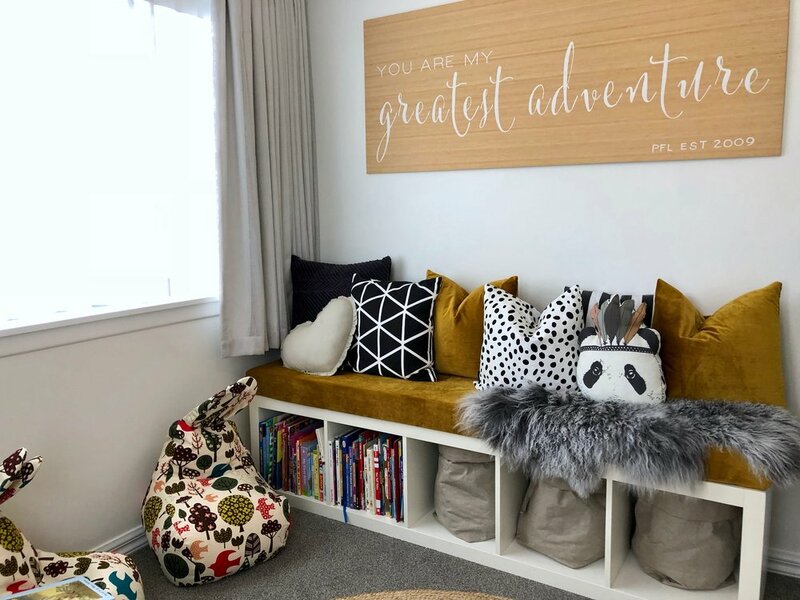 Circular woven rug from Aladdin Rugs | Wall Decals from Your Decal Shop and Bunting from Kmart | Activity Table from Trademe | Puzzle from Kmart.